All are welcome to come and skate at our full-service facility! Dates and times are available by clicking here. Resident Rate Note: To receive the Resident Rate a skater must present identification that shows residency. All skaters will be charged the non-resident rate unless they present identification at the time of admission. 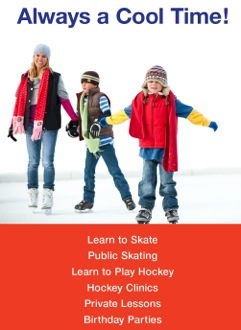 All children 7 and under must be accompanied by an adult, 18 years and older, on skates on the ice on a one-on-one basis at all times.